I think I blew my kid's mind tonight. I already shared my meal plan for the week and in order to decide what we were going to have for dinner today, I got Lil Z to pick the meal from the photos in the magazine (one of the advantages of planning from a beautifully-photographed magazine). 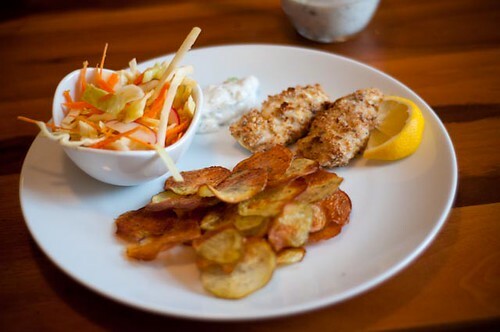 She picked the fish and chips, which I found interesting, because I don't usually serve food like that at home. Maybe it's something she eats at daycare? At any rate, I'm pretty sure her mind was completely blown when she learned today that fish sticks are made from pieces of fish (at least mine are) and that chips are made from potatoes. Woah. As mentioned before, this week's meal plan is from the May/April issue of Clean Eating (my fave magazine in the whole world right now). 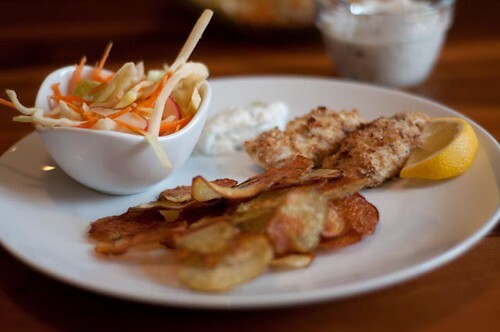 Lil Z honed in on the tilapia fish sticks, with dill potato chips and coleslaw. The recipe had an optional tartar sauce that is pretty much the best thing I've ever had. Wow. It was not at all like a normal tartar sauce (i.e., uber sweet, cloying and crazy processed). This was sophisticated, tangy and delicious. And the beauty of using the menu from Clean Eating is that the ingredient that tend to go bad before being used up (in my fridge at least) are used for multiple recipes - cabbage, cottage cheese, etc. I like that, because I hardly ever go through a whole head of cabbage. 1. Preheat oven to 350F. Line a baking sheet with parchment paper and set aside. In a food processor, process bread into crumbs. Set aside. 2. 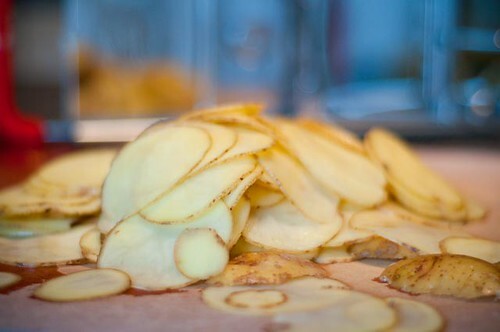 Slice potatoes as thinly as possible (I used a mandoline). Spread out evenly on baking sheet. Drizzle with oil (I was lazy and spayed with my Misto). Sprinkle with salt. Bake for 20 minutes, or until golden brown. 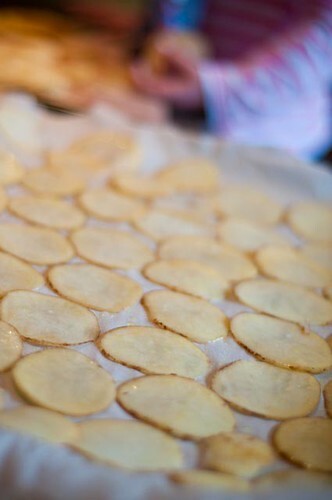 As soon as they come out of the oven, sprinkle with dill and lightly toss to comine. 3. 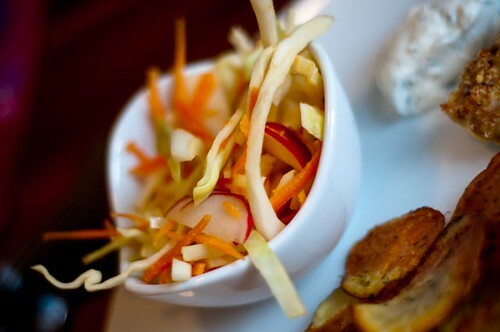 Prepare slaw: In a large bowl, combine cabbage, carrot, radishes and (apple). 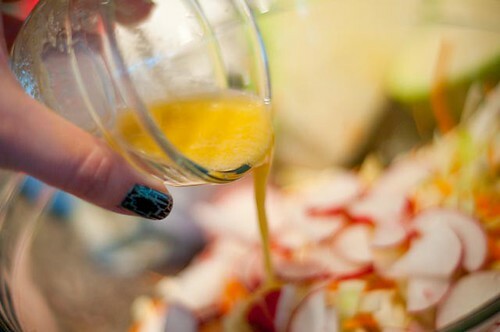 In a small bowl, whisk together vinegar, mustard and 1 T oil. Toss with cabbage mixture. 4. Prepare fish sticks. 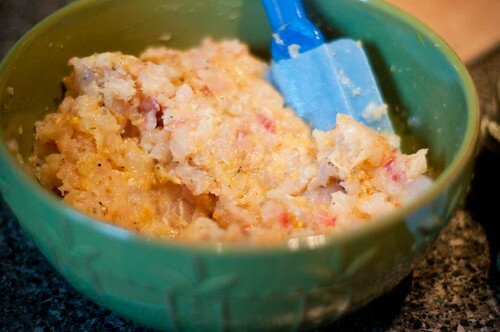 I processed the tilapia briefly in my food processor (it was already dirty from the breadcrumbs). 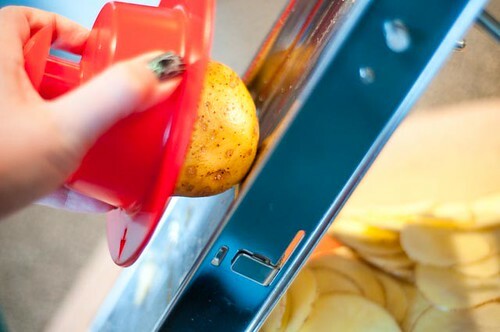 You can also chop very finely. 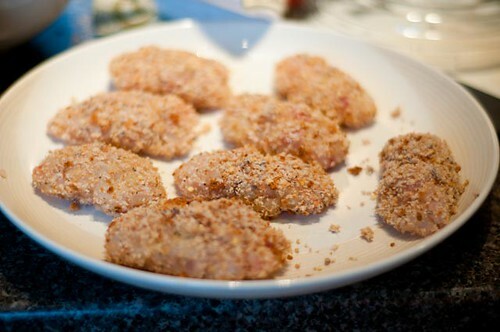 Add chopped tilapia to egg and 1/4 c bread crumbs. Add 1/2 t dried garlic and 1/2 t thyme, as well as a sprinkle of salt and pepper. Use hands (or a silicone spatula) to thoroughly combine. 5. 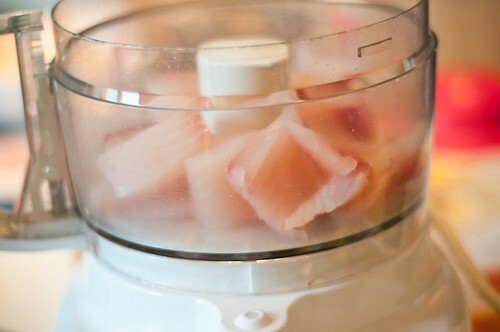 Divide fish mixture into eight equal portions, shaping each into a rectangular stick about 2.5 inches long. Pour the remaining bread crumbs onto a deep plate. 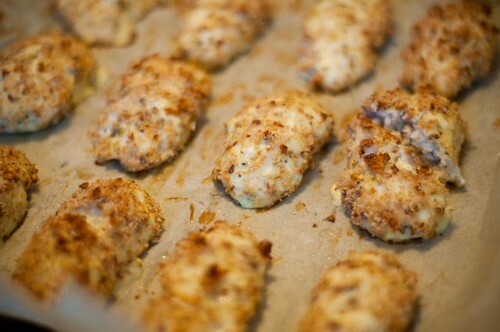 Dredge each stick in bread crumbs, pressing lightly to coat each side. 6. (The original recipe said to saute. I am lazy - I baked. It worked great). Prehead oven to 400F. Arrange fish sticks on parchment paper (I re-used the same stuff from the potatoes). Spray fish sticks lightly with olive oil. Bake for about 16 minutes. I then broiled for two minutes to ensure optimum crunch. 7. While the fish sticks are in the oven, mix together the cottage cheese, lemon juice and water in a blender/food processor (I used an immersion blender). Then add the capers, dill, celery and pepper. Friday is fish day around these parts; thanks for giving me a new recipe to try, it sounds AWESOME! What a great recipe! 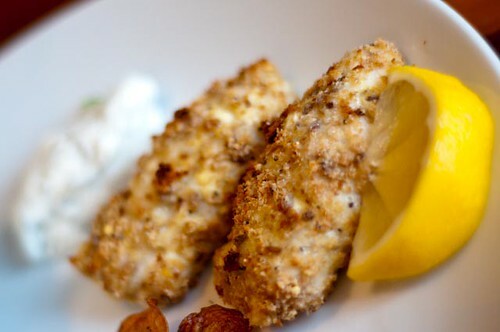 I never thought of making them with Tilapia - I usually make our Fish and Chips with Haddock. Maybe I'll try this on Friday for "Good Friday". ;) Thanks for the idea! OOh good idea. I totally skipped over the recipe inthe magazine but seeing how easy it was for you and that you baked them makes me want to revisit it! 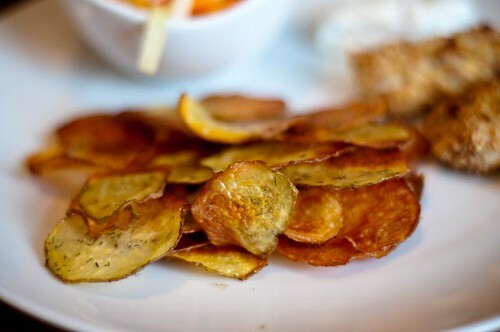 I really like the homemade potato chips. Thanks for the picture too... I must admit I was wondering how to slice them so thin! Never thought this meal could be so healthy!! I made this for dinner tonight. The potatoes took slightly longer to brown in my oven, and I ended up upping the temperature and turning the oven to convection roast to speed up the process once I hit the 20 minute mark and they still weren't done. They were cut quite thinly, so I'm not sure why they took so long. My oldest son, who hates fish, gobbled up his fish stick and called it the best meatloaf he's ever had. (I didn't have the heart to tell him it was fish.) I cook a few of them in a little bit of olive oil in the fry pan and baked the rest in the oven. 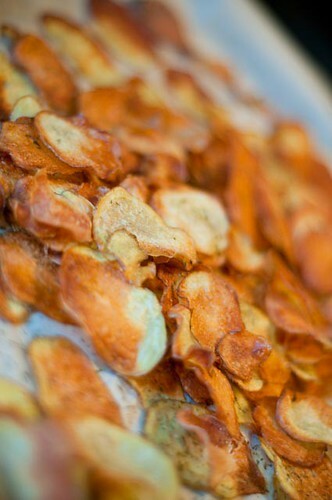 While all were really tasty, the pan-fried ones were by far our fave. Thanks for such a yummy recipe, Leslie!